Chris McGrath/Getty ImagesWashington Post columnist Jamal Khashoggi is featured on a poster during a protest organised by members of the Turkish-Arabic Media Association at the entrance to Saudi Arabia’s consulate on October 8, 2018 in Istanbul, Turkey. Saudi Arabia reportedly confirmed the death of Washington Post columnist Jamal Khashoggi in a statement released early Saturday morning local time. Initial reports suggest Khashoggi was involved in “a physical confrontation, which resulted in his death,” the Saudi statement said. Around 18 suspects have been detained by the Saudis and a top general was dismissed, according to Saudi news reports. Saudi Arabia has confirmed the death of Washington Post columnist Jamal Khashoggi on Friday. Khashoggi, a Saudi national who was also a legal US resident with a green card, had been living in Virginia. He was last seen walking into the Saudi Consulate in Istanbul, Turkey, on October 2. “Discussions between citizen Jamal Khashoggi and those who met him while he was in the Saudi Consulate in Istanbul led to a quarrel and a physical confrontation, which resulted in his death,” the Saudi government said in a statement, according to The Wall Street Journal. Saudi court officials reported that Khashoggi, who was being interrogated, died in a chokehold, according to CNN. Around 18 suspects have been detained by the Saudis and a top general was dismissed, according to Saudi media reports cited by CNN. The majority of the suspects included 15 Saudis who reportedly flew in from Riyadh the same day as Khashoggi’s disappearance. A close aide to the Crown Prince Mohammad bin Salman was also reportedly dismissed. Saudi Arabia previously denied any involvement in Khashoggi’s disappearance and claimed, without evidence, that he left the consulate on the same afternoon of his visit. 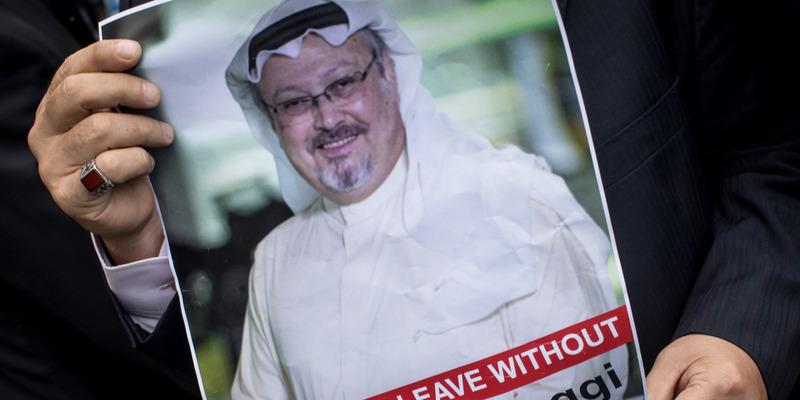 After his disappearance, Turkish authorities alleged that Khashoggi was brutally murdered, citing an acquired audio recording as evidence. US and Saudi Arabia were also privy to the recording, which reportedly indicated Khashoggi was drugged, beaten, and dismembered, according to officials cited in Turkish media reports. CIA officials reportedly listended to the recording, which proved Khashoggi was killed and dimembered by the Saudis, people familiar with the situation said to The Washington Post. Khashoggi’s disappearance prompted fierce criticism of Saudi Arabia and the crown prince, who had been seen by some as a populist reformer. Khashoggi was an outspoken critic of the Kingdom and the prince, and reportedly feared for his safety before his disappearance. President Donald Trump acknowledged on Thursday that, based on the available intelligence, Khashoggi was likely dead. Trump said previously that there would be “very severe” consequences if Saudi Arabia was discovered to be responsible for Khashoggi’s death. “We are saddened to hear confirmation of Mr. Khashoggi’s death, and we offer our deepest condolences to his family, fiancée, and friends,” White House press secretary Sarah Huckabee Sanders said in a statement. Since Khashoggi’s disappearance and the conflicting accounts from Saudi Arabia that followed, US officials, businesses and entrepreneurs have distanced themselves from the Kingdom. News organisations like The New York Times and the Los Angeles Times, have pulled their sponsorships from Saudi Arabia’s Future Investment Initiative conference, better known as “Davos in the Desert,” in Riyadh. Democratic Rep. Adam Schiff of California threw cold water on the Saudi explanation that Khashoggi was accidentally killed: “If Khashoggi was fighting inside the Saudi consulate in Istanbul, he was fighting for his life with people sent to capture or kill him,” Schiff said in a statement. “The Kingdom and all involved in this brutal murder must be held accountable, and if the Trump Administration will not take the lead, Congress must.” Schiff said.